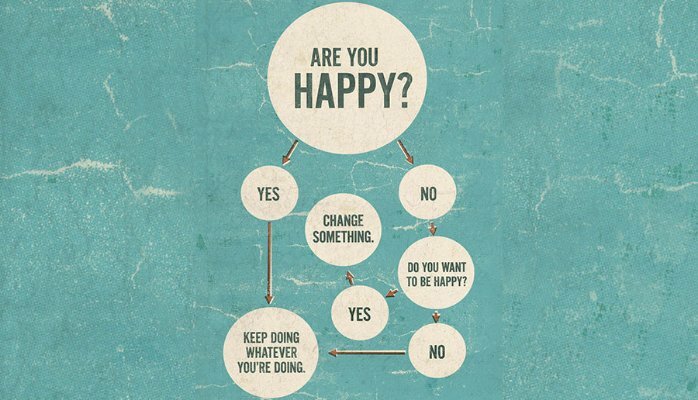 You might have seen this simple happiness troubleshooting chart before. It seems an easy enough concept – if something in your business is making you unhappy, change it. But that’s where I usually get stuck. What to change and how? Even when I think I am making a change, somehow the same issues keep popping up and that ever-illusive goal of happiness disappears down the rabbit hole again. As it turns out, there is a pretty whacky reason for this, and a way to identify what to change and how to make it stick. To understand how to truly change what isn’t working in your company, you have to consider the anatomy of your decisions. Every day, you make thousands of decisions, and all of them, regardless of size, accumulatively affect the trajectory of your business. But it’s what informs your decisions that’s important. Every one of your decisions is made with some goal of success in mind. Maslow believed that we could boil success down to a base level need for safety and comfort. Whatever level of success you are striving for, we all intrinsically want to be safe and comfortable. But we have to drill deeper and ask what safety and comfort mean to us? This is where things get a little strange, because our ideas of safety are very often the complete opposite of what is actually safe for us. Our first concepts of safety are developed from childhood and are often distorted by the environments we grow up in. As young children, our parents are our universe. Our protectors, carers and providers, both emotionally and physically. Without them, survival would be impossible. Unfortunately, these same carers can often be abusive, volatile, moody, grumpy, stressed and sometimes even downright dangerous. Or Being Safe = Avoiding confrontation to keep the peace. Or Being Safe = Rebelling against Authority figures. Or Being Safe = Staying poor because Rich People are evil. Our ideas of safety are very often the complete opposite of what is actually safe for us. Spot It, You Got It. How do you know if this is happening to you? Well, its pretty easy to identify – if you are struggling with a particularly consistent and recurring problem that refuses to be solved, its very likely that you are unwittingly applying your version of the warped safety formula, which means it will just keep coming back. Ok, so how to fix it? My personal rule is painfully simple – do the opposite of what feels comfortable. I look at my available options, over and above the one that I would normally choose, and I go for the one that makes me feel most uncomfortable, because that’s most likely the best route to take. There’s a saying, “If you want something done properly, do it yourself.” That’s me. When encountered with a situation where I could delegate or do it myself, my comfort life-formula tells me to do it myself. The problem with that is I don’t actually have the time (partly because I have taken on other projects I shouldn’t have), so I push other important tasks out of the way, work late, rage at the machine and feel sorry for myself, but I get it done. I get it done at huge cost to other projects, my freedom, and my quality of life. Ironically, doing it myself doesn’t actually mean it will be done properly, but it has appeased my need for feeling comfortable with my decision, no matter how damaging it is and so the problem is kept in play. The proper way to deal with this consistent problem is for me to choose what feels alien and uncomfortable i.e. delegate it to someone else. It feels like I am losing control, I can’t dictate every nuance of the project. Most importantly, it doesn’t appease my selfish need to feel comfortable with my decision. But the reality is that it frees me up to run my business and spend more time on enjoying life, so while it doesn’t feel right, it is clearly the right decision for me. Slowly but surely, I have been implementing my “do-the-opposite-of-what-feels-comfortable” rule and it’s working. There are less of those obstinate, recurring problems in my business, which in turn gives me more time to focus on achieving my goals.